Like many who've come across is the Harvard Classics Set, I've often thought of reading the entire series from start to finish. 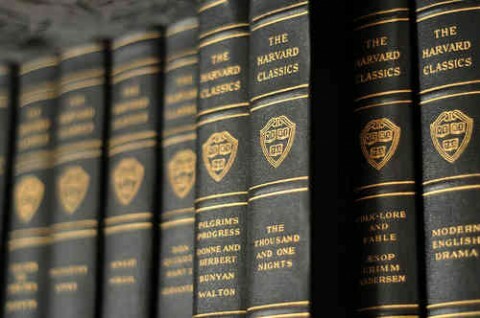 For those of you that don't know what the Harvard Classics Set is set of 51 books assembled by Charles Elliot. His premise was that anyone can gain a liberal education with just the contents of a 5 foot book shelf and 15 minutes a day -- it might whiten your teeth too. Elliot was the president of Harvard University for 4 decades and helped steer the way the school operated, changing it more to the model it is today. When the first set was released in 1909 only 13 percent of the US population had finished high school and only a minuscule 3 percent had finished college. The promised of buying intelligence probably appealed to many since there weren't many available paths to high levels of learning. At the very least it would display well in the living room and signify the eruditeness of the household. Christopher Beha embarks on the journey to read the entire 22,000 pages of the set over the course of the year. He documents in the more memoir The Whole Five Feet: What the Great Books Taught Me About Life, Death, and Pretty Much Everything Else. I am very thankful that I only had to spend a weekend reading this book, then dedicating the effort and time to tackling the whole set, but at the same time it's a little weird to read about reading. Beha's year of reading was far from just sitting around reading, and he does a great job weaving the reading with the many life events that happen to him in short space of 237 pages. I have to imagine that reading the great minds pre 20th century would help deal with the trials Beha faces. I don't think he has to force the synchronicity of the life events on the wisdom of writers like Emerson, Marcus Aurelius and Dante. I find the most interesting part of the book is Beha's constant struggle to justify the breadth of the reading. Most of us spent College diving deep into a very short reading list, though it felt long at the time. I don't think he gets to a answer for himself or the reader, but I have to think that the breadth is justified. If you spend your time on a very small selection of writings or even one author you don't really share in the conversation that books represent. Reading and then talking about a similar canon draws you near to other people and helps you see other views. While you can't read everything, there is a common list of books that people are talking about or that provide common insight into the human experience. I lean on the reading more so you have more competing ideas floating around your head.